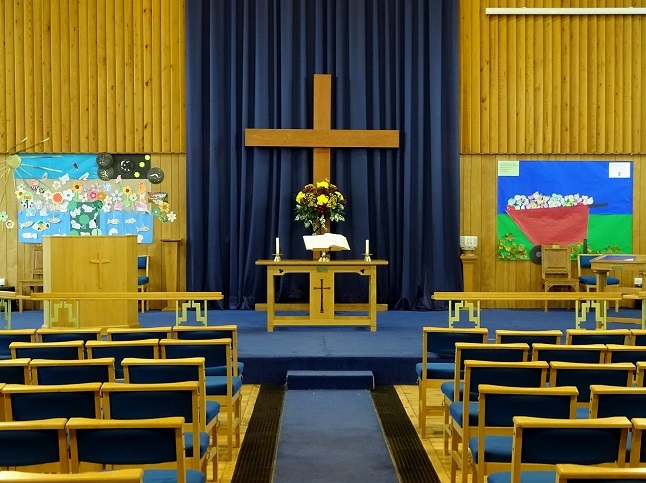 At Eltham Park Methodist Church you are assured of a warm welcome. There is step-free access via a cafe area before you enter the church. This is a large, airy space with a modern feel and there are plenty of comfortable chairs. You simply sit where you wish. Most of our congregation arrive 5 – 15 minutes before the service begins. The doors are usually open 30 minutes before the start of the service. You will be welcomed as you arrive and given hymns books and the weekly church newsletter. The service lasts about 1 hour and contains a number of hymns, readings from the Bible to which the preacher will add an address, helping with understanding the reading (s) and its relevance for today. Prayers follow the traditional pattern of Confession and Intercession. Once a month we include the service of Holy Communion, where Christians meet in a special way with Jesus and hence with God. The bread and the wine (non alcoholic) are taken as an encounter with the love of God in Jesus. All are welcome to receive the bread and the wine in this act of faith or simply approach for a blessing. Finally during the service the offertory is taken where the congregation is invited to make a donation so that the work of the church may be financed. After the service tea and coffee is served in the cafe and everyone is welcome to join and have a chat.